When it comes to hardscaping your home you’ll be faced with a lot of important decisions. One of the biggest ones is choosing between stamped and stencilled concrete or going with a paving option like bluestone. It’s a big decision to make because hardscaping is a significant investment and you want to choose the option that will deliver on aesthetics, durability and value for money. So, the best way to make the decision is to take all the contributing factors into hand and make an informed decision. Budget is important, but you have to love the way something looks so there’s no point simply choosing the cheapest option. Bluestone pavers and other paving options like sandstone look great. They offer a completely natural look and beautiful variation between one paver and the next. The beauty of stamped and stencilled concrete is that it can mimic any look you want to achieve. You can recreate the stately look of bluestone pavers or the Mediterranean, coastal feel of sandstone. So, if the two essentially look the same how do you make the choice? The modern life is a busy one and we all want a house that is easy to maintain. This extends to our hardscaped areas so which of the two options is easier to maintain? Well, stamped and stencilled concrete is as easy to maintain as a plain concrete slab. To keep it clean all you need to do is give it a sweep and maybe a hose down every now and then and it will look perfect for years to come. Textured patterns are also perfect for hiding stains and the hairline cracks that can sometimes affect concrete. Pavers are set on top of sand and you need to keep sand between each paver in order to prevent them from coming apart. 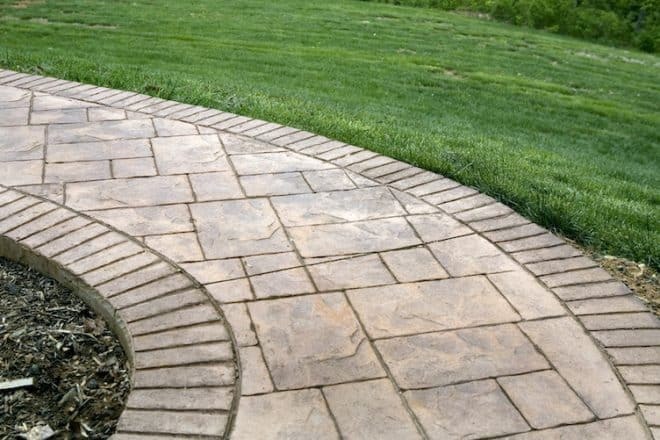 Depending on the type of paving material you have selected you may also have to re-grout every now and then and there’s the constant problems of weeds pushing their way through the gaps in the pavers. You don’t face any of these problems with stamped and stencilled concrete so it’s a clear winner when it comes to maintenance. Once again, concrete is a clear winner in this category. Concrete is legendary for it’s toughness and that’s why it has become such a staple of the construction industry. If it is poured right it really doesn’t have an expiry date and it will stand up even under heavy traffic and harsh environmental conditions. Pavers, on the other hand, are susceptible to cracks and chipping and they do tend to show more wear and tear. Bluestone pavers, sandstone pavers and travertine pavers all look fantastic but you may be regretting your decision when they start to crack, chip and wear in the future. If you want something that will last you can’t go past concrete. Aesthetics, durability and maintenance are important factors but you need to keep the safety of your home in mind when you choose your hardscaping material. The beauty of stamped and stencilled concrete is that the texturing makes it anti-slip and because it is poured in a continuous slab you don’t have to worry about tripping on any uneven portions. Pavers offer good drainage but the smooth texture of materials like bluestone and slate can make them very slippery. The pavers will also settle into the base and different rates meaning the surface will be very uneven. Now comes the important part. Even though it’s not all about finding the cheapest option its still nice to get good value for money. Concrete is incredibly cost effective. Not only is it significantly cheaper upfront than paving options it is more durable meaning you get better value for money in the long run. When you weigh up all the factors stamped and stencilled concrete truly is the right choice for anyone looking to hardscape their backyard. It offers complete flexibility you can even mix and match looks throughout your backyard using the same materials. You can have a sandstone look around the pool and travertine in the patio and you don’t have to foot the outlandish costs of actually using those materials. On top of the aesthetic flexibility you can also enjoy greater durability and less maintenance, which means less work for you and more time actually enjoying your backyard. So, if you’re about to hardscape your backyards go with concrete. You’ll be amazed at what you can achieve with stamping and stencilling techniques and how much you can do with your budget.